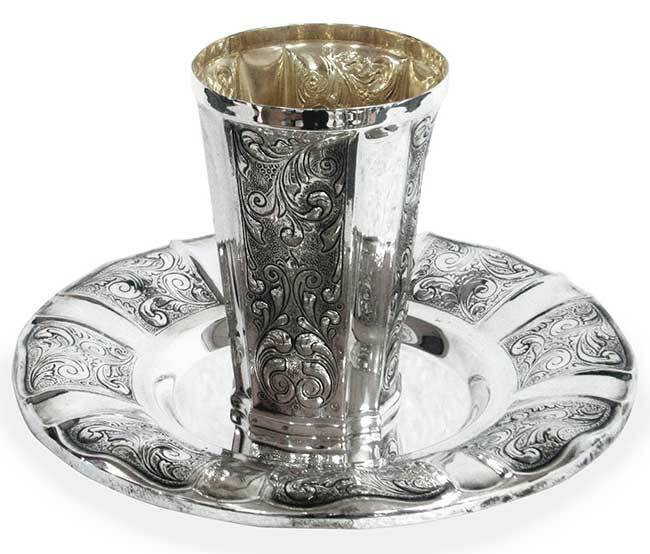 925 Sterling Silver Kiddush cup set - Yisachar. A classic and best-selling "Becher Set", The theme is about alternating stripes with hand chasing carvings and stripes that are modernly high-polished with design at all. The cup is round at the top and converts to a semi square at the bottom. This sterling cup set has a very decent weight and is relatively large sized to make the ultimate impression. A set like this one will make an appropriate gift for Bride / Groom, a special Bar-Bat Mitzvah or any special occasion. Made in a family owned and operated factory in central Israel. Sterling silver has been admired in Jewish culture for centuries, look back at the few items you inherited from your Great Grand Bubby, it is almost always a piece of silver. Looking forward, invest in something that will be cherished for a lifetime and will be passed down from Dor L'Dor (generation to generation). Personalization options as you proceed to checkout.